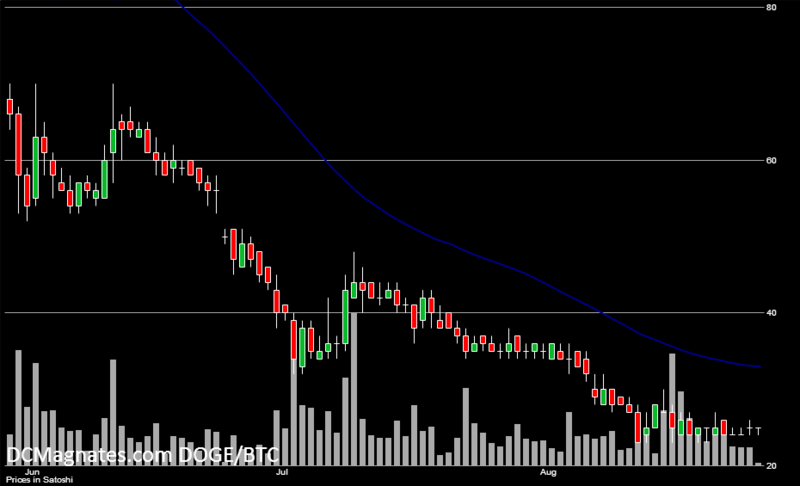 Dogecoin flat near historical lows: is it bottoming out or facing the fate of other alts? Dogecoin (DOGE) has not escaped the tough times to have recently befallen crypto markets, although it could have been worse. Dogecoin (DOGE) has not escaped the tough times to have recently befallen crypto markets, although it could have been worse. Even the appearance of DogeTipBot’s Founder Josh Mohland on This Week in Startups hasn’t helped breath life into the coin, whose volumes have declined. 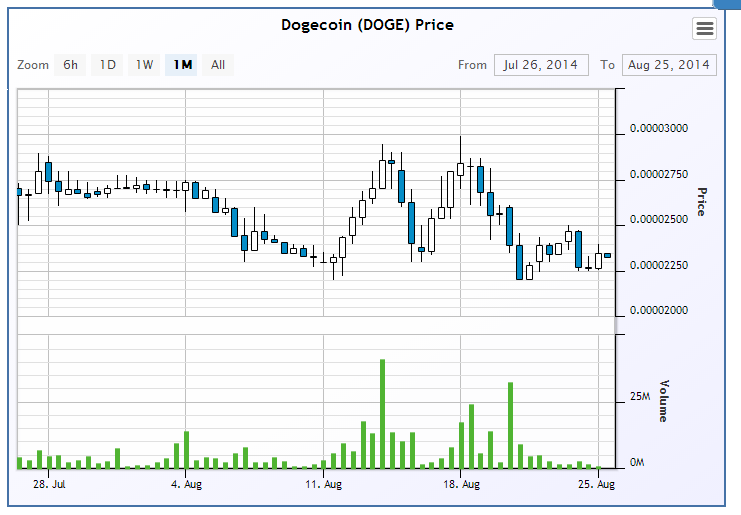 During the latest rounds of selling, Dogecoin has occasionally mirrored the price moves of its progenitor Litecoin. The difference being, DOGE has refused to move below its floor of 23-24 satoshi whereas Litecoin has had no problem advancing to new lows. With the flat behavior, DOGE has maintained its 27% offset below its 50-day moving average, now at 33 satoshi. So which has performed better? On Cryptsy, the DOGE/LTC has underperformed during the past month, losing about 13% to 0.023 mLTC, although Litecoin’s volatility during the period actually gave DOGE the upper hand at certain points. Also, recall that DOGE is popularly evaluated in terms of BTC, which has itself declined during the month. One is tempted to think: if we’re dealing with the scale of 10-30 satoshi, the currency’s micro denomination simply doesn’t allow much more room to go lower. A quick look at dozens of other alts- and penny stocks- puts such fantasies to rest. From a technical analysis perspective, DOGE’s decline slowed down last week, followed by a flat-lining in recent days- the optimist’s pattern for a turn-around, or at last a brief bump. Fundamentally though, the crowdsourced coin originally derived the bulk of its value from the excitement, originality and endearment that prevailed following launch. These have since evaporated, leaving you with what appears to the market as a micro-denominated version of Litecoin- whose trajectory is not encouraging. The two are now merge-mined. Without a dramatically new brand or version equally capable of flattering the masses, other alts incorporating advanced technological sophistication and originality may be now be viewed as the market’s safe haven- or growth sector.